One of the first important lessons that a baby learns is to avoid “Hot!” Sadly, that lesson often occurs after a burn. A new study published in Archives of Diseases in Childhood has found that 1-year-old children are at a greater risk of becoming burned or scalded than their older siblings. In fact, that risk is 10 times greater. The research conducted for this study revealed that of all the burn and scalding cases presented to European hospitals, half of the patients were children. 1-year-olds have the majority of burns and scalds. 48% of scalding occurred when a child yanked down a hot drink from a counter or table. 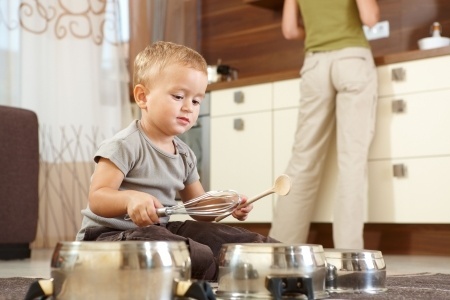 76% of scalding in kids between 5 and 16 were the result of pulling down hot water during cooking. 81% of children under five suffered contact burns came from touching hot items like curling or clothes irons. 50% of older children received burns from outside of the home. All of this makes sense as you watch how a baby develops. Once they discover that those “things” attached to their arms are meant to grab stuff, everything is fair game. Researchers have found that around the age of 3, this lesson of “Hot!” seems to take hold as less toddlers show up in the E/R. We all live in a home with hot items. So, how can these kinds of accidents be prevented? Staying vigilant is the obvious answer. For instance, a hot cup of tea can cause a potentially disfiguring scar if spilled on the skin within 11 minutes of it being poured into a cup. A curling iron could stay hot for up to 8 minutes after it has been shut off. “Successful prevention is most likely to involve product design or environmental modification,” researchers said to Medical News Today, “and should be considered for hair straightener, iron, and oven-related burns. Public information messages, children’s centers, health visitor or family nurse practitioners should address safety education as a matter of routine,” they add. Are you aware of what your baby can reach? Don’t assume everything will automatically be out of their grasp. When it comes to grabbing, pulling and tugging, babies are the experts. Rick B grew up in Baltimore and now makes his living as a writer in Los Angeles. He has written on many topics but none more personal than parenting. That's because he just began his journey as a new dad! He is happy to share his experiences. Lot's to research and write about for sure!